Jurors heard Michael Jackson's personal physician describe to investigators the superstar's restless final night, which included a plea for something to help him sleep, and his response after he realized his patient wasn't breathing. 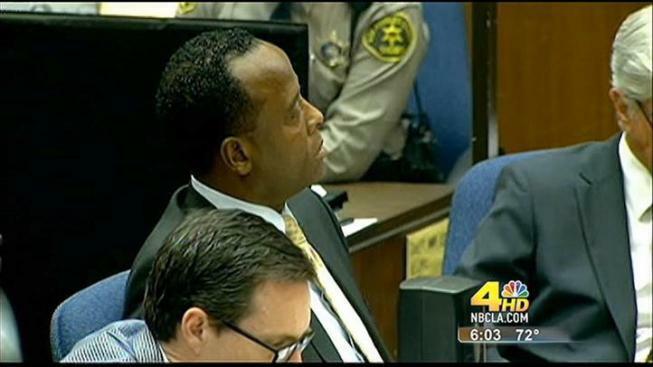 The account of June 25, 2009 -- the day Jackson died -- came during Dr. Conrad Murray's interview with investigators, which was played for jurors Friday in the doctor's involuntary manslaughter trial. "He tried to close his eyes, and nothing would work," Murray said during the interview. "He complained that he would have to cancel rehearsals... and not satisfy his fans if not rested well." The defense suggested sloppy investigative techniques may have compromised evidence. The two-hour interview audio recording is considered one of the prosecution's most important pieces of evidence. It had never been played before in public and a transcript had never been released. Murray discussed his treatment of Jackson, including his administration of the powerful anesthetic propofol, during the interview. A coroner's report on the King of Pop's death cited "acute propofol intoxication." On the recording, Murray told investigators that Jackson's personal assistant contacted him in the spring of 2009 about meeting Jackson prior to a planned series of concerts in London. "He said Mr. Jackson would very much like me to be part of the trip," Murray said after telling investigators he had treated Jackson "off and on" since 2006. Testimony showed that Jackson had agreed to pay Murray $150,000 a month. 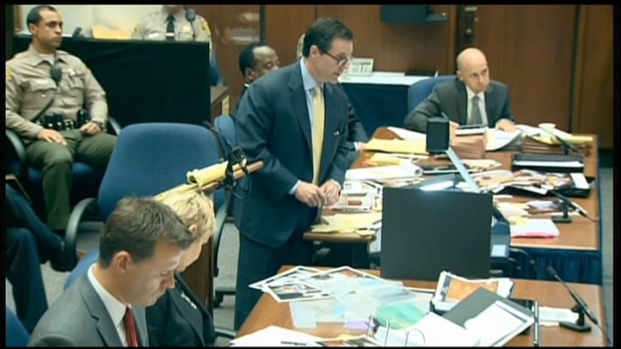 Murray said he was spending six nights per week at the rented Holmby Hills mansion at "Mr. Jackson's request." He typically placed a dermatological cream on Jackson before describing the use of medications to help Jackson sleep. "He is not able to sleep naturally," said Murray. Detectives asked him to provide a chronological account of the night, repeatedly bringing Murray back to the timeline when he strayed toward other details. Murray told investigators he watched Jackson fall asleep at about 3:15 a.m. after a late rehearsal, but that he awoke about an hour later and began telling Murray how he "could not function" if he did not sleep. Murray said it was about 10:40 a.m. when Jackson said, "'Please, please give me something.'" The precautions included oxygen nearby and a fingertip monitor to check the singer's oxygen saturation level, Murray told detectives. Prosecutors called a medical equipment company executive to the stand earlier who testified the equipment Murray used was not adequate for the administration of propofol. "He asked for this before?" a detective asked. "I've given it to him before," Murray responded. Other Jackson doctors also administered propofol, which the entertainer called his "milk," to help him sleep in the past, Murray told investigators. "Before you were hired on as his doctor, were you aware he was taking it on a daily basis?" a detective asked. "I was not aware, but I was a bit surprised," Murray responded, adding that he tried to wean Jackson off the medication. "He explained to me he had taken it multiple times." Murray said he left the room for "about two minutes" and returned to observe that Jackson was not breathing. Prosecutors have argued that Murray adminstered the propofol, then failed to properly monitor Jackson June 25, 2009 in the bedroom of a rented Holmby Hills mansion. But the defense claimed it was Jackson who self-administered the fatal dose when Murray left the bedroom. "His body was warm, there was no change in color," Murray said. "I started immediately to perform CPR and mouth-to-mouth." Murray said he could not move Jackson off the bed and conducted chest compressions with his left hand as he used his other hand to call Michael Amir Williams, Jackson's assistant, on his cell phone. Williams testified that he was in downtown LA when he received Murray's "frantic" call, so he immediately called security guard Alberto Alvarez, who was at the Carolwood Drive mansion. Murray told detectives he ran downstairs and told Jackson's chef to "have security come immediately." Alvarez, who earlier testified he responded to the bedroom to find Murray conducting chest compressions with one hand, was the first member of Jackson's security team to enter the bedroom. "I said, 'Call 911,'" Murray told detectives. Alvarez testifed that Jackson's two older children were nearby when he arrived in the second-floor bedroom, and that Murray told him: "'Don't let them see their dad like this.'" It was Murray's disclosure regarding the location of propofol bottles during the interview that prompted investigators to search the superstar's bedroom two days later. Court proceedings ended Friday at about 3 p.m. Jurors will hear more of the recording when court resumes Tuesday. Earlier Friday, the defense completed its cross-examination of coroner's toxicologist Dan Anderson. Propofol was found in various parts of the singer's body, his blood and urine during an autopsy, Anderson testified. Jurors have heard about and seen pictures of the drugs throughout the trial's first eight days -- propofol, lidocaine, lorazepam and others. They've also heard testimony from one of Jackson's security guards, who claimed that a frantic Murray demanded he hide bottles of medicine when the two were in Jackson's bedroom just minutes before paramedics responded to the estate. A defense attorney tried to get Anderson to say that high levels of the sedative lorazepam found in Jackson's stomach meant that he swallowed the drug himself. Anderson told jurors he could not make that determination based on the information provided. The defense asked whether Anderson focused too much on propofol and should have also considered the effect the sedative lorazepam had on Jackson's body. "You came to a quick judgement that propofol was the most important drug in this case, didn't you?" asked attorney J. Michael Flanagan. "Yes, I did," Anderson said. "Did you think that lorazepam was not significant?" Flanagan asked. "I think it has its importance, but it's not the red flag that caught my eye," Anderson said. "The propofol in any case that we handle is important, probably more important than many of the other drugs that we deal with." Lab results presented Thursday showed that Jackson's fingerprints were not found on the medical evidence -- vials, syringes, bottles -- taken from Jackson's bedroom. Only two prints were found -- those of Dr. Murray and a coroner's investigator. But investigators were not able to lift prints from several pieces of medical evidence -- nine bottles of propofol, a syringe, IV tubes and sedative vials -- and a set of mystery prints was found on other items. Prosecutors read a statement, written with defense attorneys, that informed jurors a lack of prints didn't necessarily mean the evidence wasn't handled. Refresh this page for updates and to watch a livestream when testimony begins.